Bali-Hindu religion is permeated with hundreds of gods, goddesses, spirits, animals and otherworldly humans like witches. The presentation of these beings in Balinese performance art, cultural dance, sculpture and painting necessitates a visual representation that the audience can identify with. 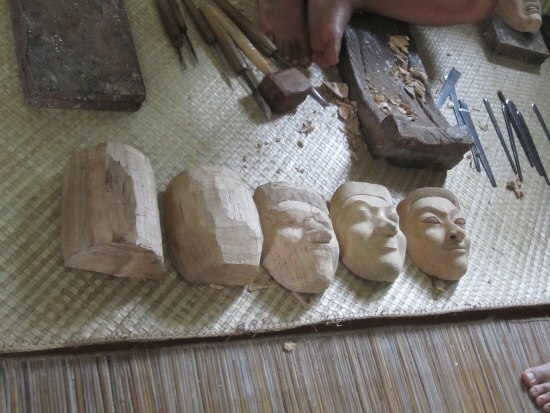 Hence, Mask Carving has evolved to provide the visual “personality” that Bali-Hindus can use to apply to their cultural entities during dances, story-telling and religious festivals. Masks are used in nearly every culture on the planet. 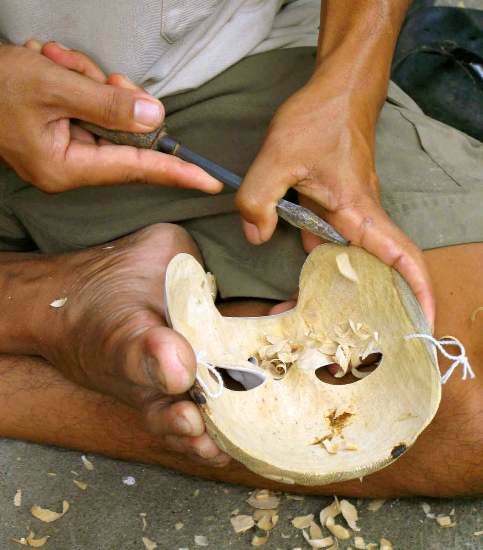 In Bali, the predominant Hindu religion makes use of masked human performers every day, and mask making is a viable career for a Balinese wood carver. How often does one get the opportunity to carve their own wood mask? Our expert carvers will guide you to creating your one-of-a-kind mask creation in just 3 hours time. It’s fun, it’s educational and it’s art. Children really enjoy the chance to make their own mask and our classes normally involve entire families spending time together creating their personalized masks for each person. Very often, well have individual family members exploring both mask making and wood carving simultaneously. Our teachers are comfortable with all ages and all skill levels. And don’t forget, the fun isn’t over, these new carved wood creations will need to be painted once you’ve got the family home! WS Art Studio Mask Carving, the studio of master artisans and teachers. Learn to create your own stylish masks and more! Book for a session now!